It’s that time again! 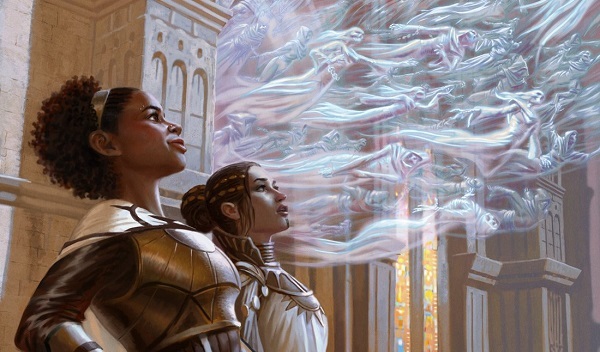 Ravnica Alligience is here, and the Orzhov Syndicate is back to play. This time around, their guild mechanic is Afterlife, which creates white and black flying Spirit creature tokens after your creature dies. This doesn’t look like it was designed with multiplayer in mind, but that doesn’t mean we can’t make good use of it in EDH! Getting extra sacrifice fodder is never a bad thing after all, and Afterlife gives us plenty of that. Apart from their guild mechanic, the Syndicate has cooked up some truly stellar cards. Let’s take a look at who’s leading the guild these days and then jump right in, shall we? 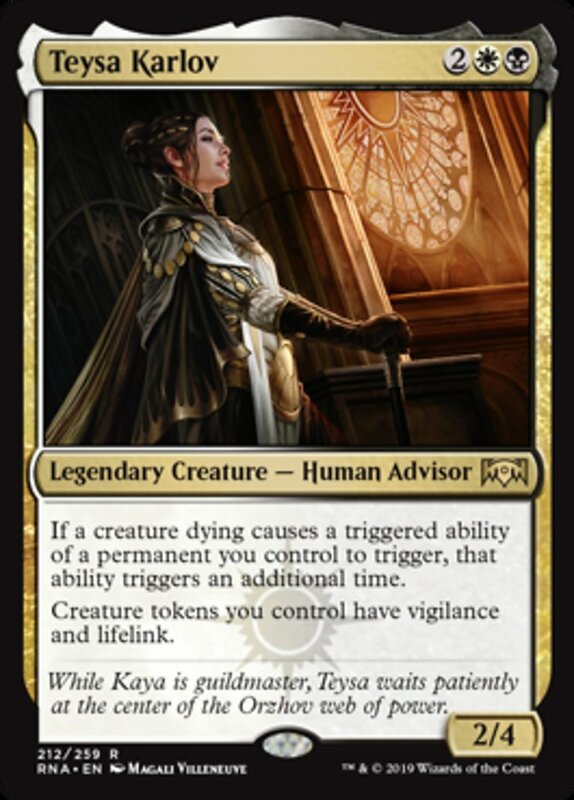 Oooh man, Teysa Karlov is everything a white/black/X commander player could possibly want. At four mana, she’s neither cheap, nor expensive. She has a high toughness, which gives her some staying power on the board. Plus, she doubles your death triggers… she doubles your death triggers!? All of your Blood Artist triggers, all of your Dictate of Erebos triggers, all of your Grim Haruspex triggers? Doubled! And, oh hey, she gives your creature tokens vigilance and lifelink, because why not? The most obvious parallel to Teysa is Panharmonicon, a pretty recent card that introduced a double-triggering effect for your enters-the-battlefield abilities. It’s proven to be a very powerful card, showing up in over 15,000 decks, as well as a few of my own decks. Will Teysa see as much play? 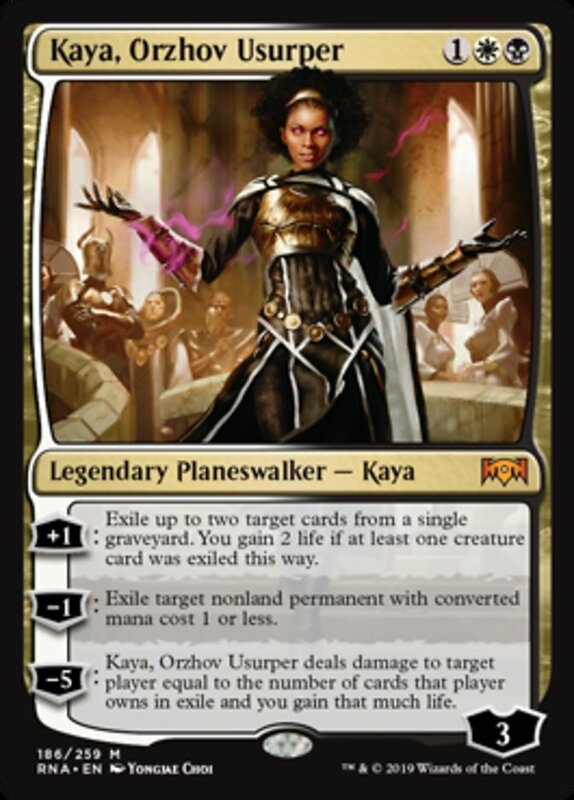 If you don’t fancy her as the commander, or you want to brew her with more colors, Teysa slots right into the 99 for commanders that create death triggers, like Athreos, God of Passage and Reyhan, Last of the Abzan + Tymna the Weaver, or in the 99 of someone like Alesha, Who Smiles at Death with the new Judith, the Scourge Diva. 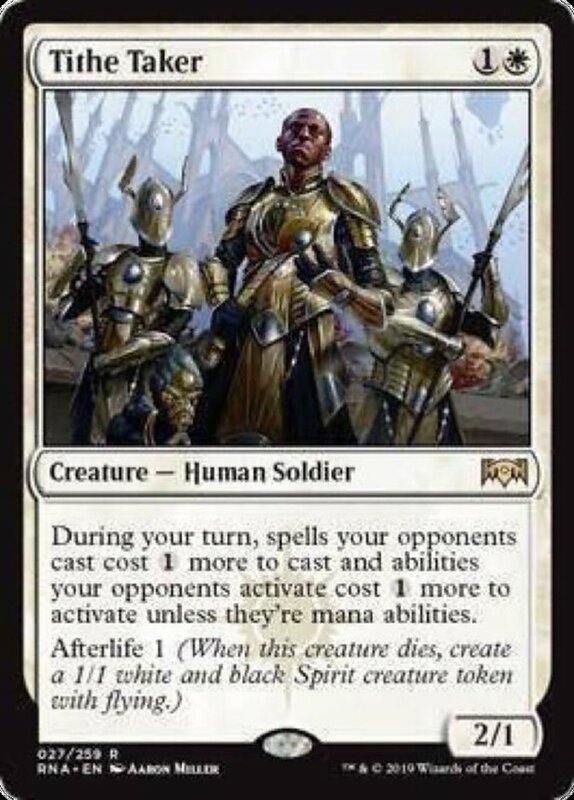 The new guildmaster Kaya, Orzhov Usurper looks supremely milquetoast at first blush. However, that innocuousness is a huge boon that can allow her to survive, slowly ticking up to lethal consequences for your unwary opponents. It’s pretty improbable that anyone is going to care about Kaya’s +1 ability; you exile a few cards, maybe gain some life, no big deal. Her -1 might eat some Sol Rings, and maybe some Llanowar Elves or other mana dorks, but it’s not terribly high-impact. Kaya’s ultimate also looks like it will be very low impact. Using only her own abilities, she can make someone lose four life and you gain four life. If you build around Kaya – if you include cards like Ulamog, the Ceaseless Hunger, Leyline of the Void, Rest in Peace, Planar Void, Bojuka Bog, Scavenger Grounds, or any other number of effects that exile whole swaths of cards – Kaya’s ultimate is a one-shot kill that will also make it really hard for any remaining opponents to knock you out. She’s niche, but she can certainly sneak up and steal the game. 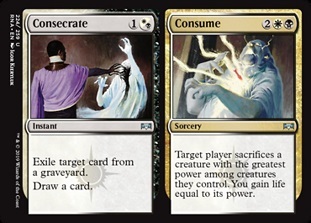 Consecrate // Consume is the uncommon Orzhov split card. Consecrate isn’t going to be terribly high-impact, though a clutch play to disrupt someone’s Animate Dead will occasionally present itself. Consume, on the other hand, is more generally useful. 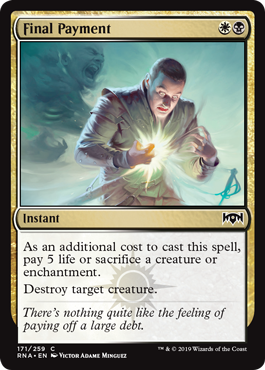 Edict effects are strong tech, especially against Voltron strategies, and like Crackling Doom, this forces your opponent to sacrifice their biggest creature. When considering both halves together, I’d say I’m cautiously optimistic about it, and will be doing some playtesting with it. 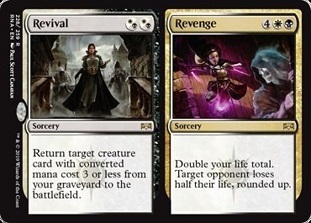 Revival // Revenge is our rare Orzhov split card, and I have to say, it’s one of my favorite split cards in the entire set. The Revival half joins a small group of cards like Unearth that reanimate small creatures for cheap. As someone who really enjoys building low-to-the-ground bleeder decks, these cards are often as good as Reanimate, pulling back dinky bit important combo pieces or utility creatures for very little mana. Revenge is probably my favorite thing about this card, though. It’s a Beacon of Immortality stapled to a Blood Tribute. This card is just mean, and bonkers when you run it in any WBx deck that cares about life totals. It’s great in Karlov of the Ghost Council, or especially in Ayli, Eternal Pilgrim, which could also occasionally use the Revival half to get back her sacrifice fodder. I’m expecting to see a lot of this card… I just hope I don’t do anything to deserve the attention of anyone’s Revenge. Final Payment is the only common I’ll be talking about in this review. Taken at face value, as far as single-target creature removal goes, this card is fantastic. It’s no Terminate, but remember, sacrificing your stuff can be a huge boon; Diabolic Intent sees a lot of play for this exact reason. Final Payment is flexible with its additional cost, allowing you a free sac outlet for a creature, or maybe a quirky enchantment like Hatching Plans (bring on the janky Ertai, the Corrupted decks, I’m here for them). If you just can’t dredge up some sacrifice fodder, you can always just lose life. This card is something like a crossover between Bone Splinters and Devour in Shadow. If it was mono-black it would be a top-tier removal spell. Unfortunately, since it’s in both white and black, it’s a bit outclassed by Mortify, Anguished Unmaking, and Utter End. 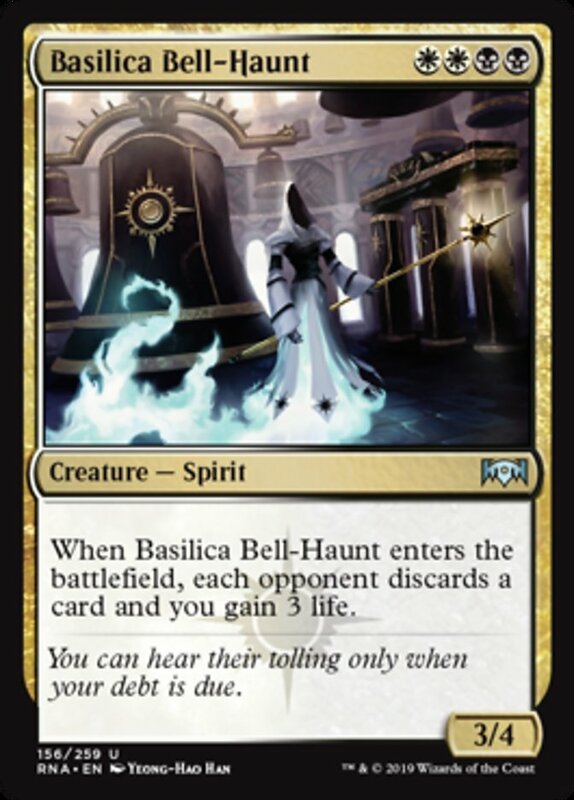 In EDHREC’s Top 10 of 2018 article, I mentioned that asymmetrical discard had been getting a lot of love recently, and Basilica Bell-Haunt joins the ranks with open arms. Hand hate, or hand stax, has become increasingly popular with older cards like Bottomless Pit, Stronghold Rats, and Syphon Mind, all paired up with newer cards like Liliana’s Specter, Burglar Rat, and Vicious Rumors to build a really nasty brew that has your opponents scrambling to hold on to even one card in their hand. Double white and double black in the mana cost makes this card a pretty difficult to cast, though. I wouldn’t try to run it in a deck with three or more colors. Mortify is a reprint from Guildpact in the original Ravnica block. For years this was the best instant-speed removal that Orzhov had to offer, and it still shows up in over 17,000 decks to this day. However, it has been rightly unseated by Anguished Unmaking (22,049 decks) and Utter End (20,122 decks). Notably, it does still see more play than Vindicate, which surprisingly sees play in just 10,412 decks, the fewest out of any of the Orzhov single-target removal spells. It seems like players these days value speed over the marginal upside of being able to remove a problematic land. I’m sure an abundance of Strip Mine-like effects helps to further edge Vindicate out. In the meantime, Mortify may have better contemporaries, but it’s still a card your opponents have to respect. Aristocrats is a popular archetype in many formats, and at 4,619 decks it’s one of the top 10 archetypes on EDHREC. 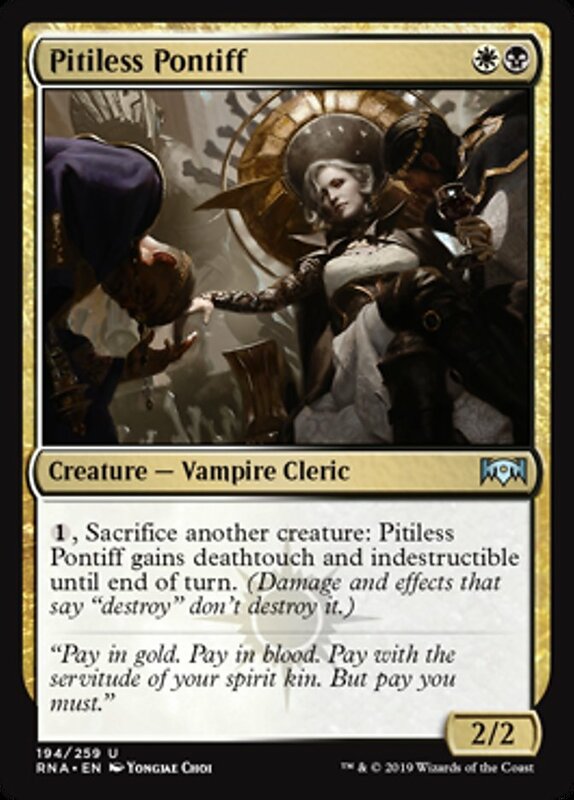 I expect Pitiless Pontiff will slide right into the DMs of EDH Aristocrats players everywhere. Aristocrats like Yahenni, Undying Partisan and Cartel Aristocrat also protect themselves, but the added deathtouch on this card makes it a resilient rattlesnake, dissuading your opponents from attacking you. Pontiff is a shoo-in for decks like Krav, the Unredeemed + Regna, the Redeemer, Elenda, the Dusk Rose, and Edgar Markov. Etheral Absolution is the anthem no one asked for, but everyone is glad that they printed. This card is an absolute house! Straightaway you may be associating it with Elesh Norn, Grand Cenobite, or her predecessors, Ascendant Evincar and Crovax, Ascendant Hero, but this card is so much better than that! What’s one of the #1 problems people encounter when they run Elesh Norn? Their opponents reanimate her, clone her, or steal her, and all of a sudden, their board of weenies is in the graveyard, never to return. Ethereal Absolution is an enchantment, and it is not easy to steal or even reanimate an enchantment. You’d have to start dipping into the weird end of the card pool with stuff like Crime // Punishment to do that. That already makes it far harder for your opponents to twist against you. But wait, there’s more! 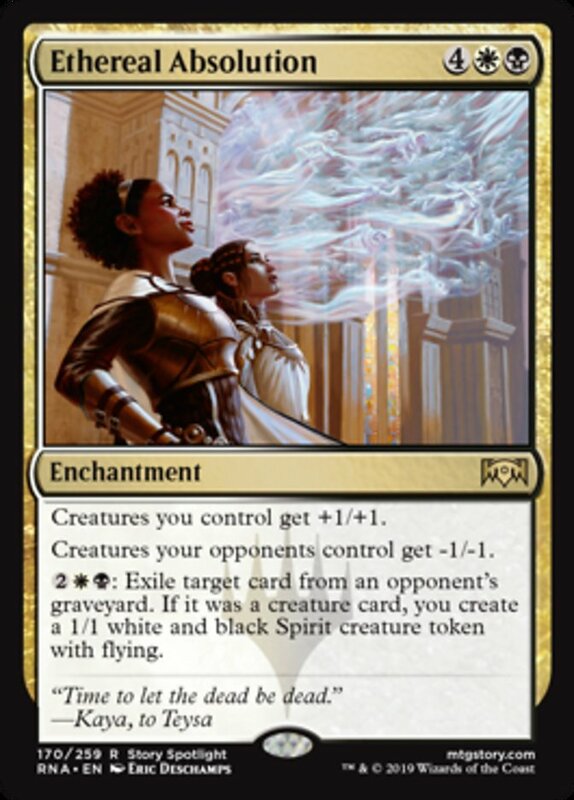 Not only is this card an anthem and one-sided Night of Soul’s Betrayal, it’s also Beckon Apparition on a stick; graveyard hate that sends out flying 1/1s. Buffed 1/1s that trade with your opponents’ nerfed 3/3s. This card is utterly fantastic in most B/W/x decks. Play it. Kaya’s Wrath is the hot new wrath of the set. It’s not quite as flexible as Merciless Eviction from Return to Ravnica, but it’s still a nice interpretation of a pseudo-Fumigate, even if it only counts your own creatures. It costs one mana less than Fumigate, but again, that double black/double white in the casting cost is rough, and this card probably shouldn’t see play in many decks of three or more colors, just due to the difficulty in hitting the mana requirements. I would certainly think about this for an Ayli, Eternal Pilgrim or Karlov of the Ghost Council list. Tithe Taker is the new, slightly underpowered Grand Abolisher. The fact that he doesn’t cost double white is certainly an improvement, but he lets your opponents play around the tax he levies. I think I’d rather run Conqueror’s Flail than this card. It has similar staying power in that it will survive a board wipe, and you can always reequip it to your commander pretty cheaply. When Tithe Taker was spoiled, I saw a decent amount of hype about it, but I just can’t get behind it. Maybe specifically in something like a Baird, Steward of Argive, Grand Arbiter Augustine IV or Isperia, Supreme Judge tax-themed deck, but I can’t really see it in a lot of decks outside of that. 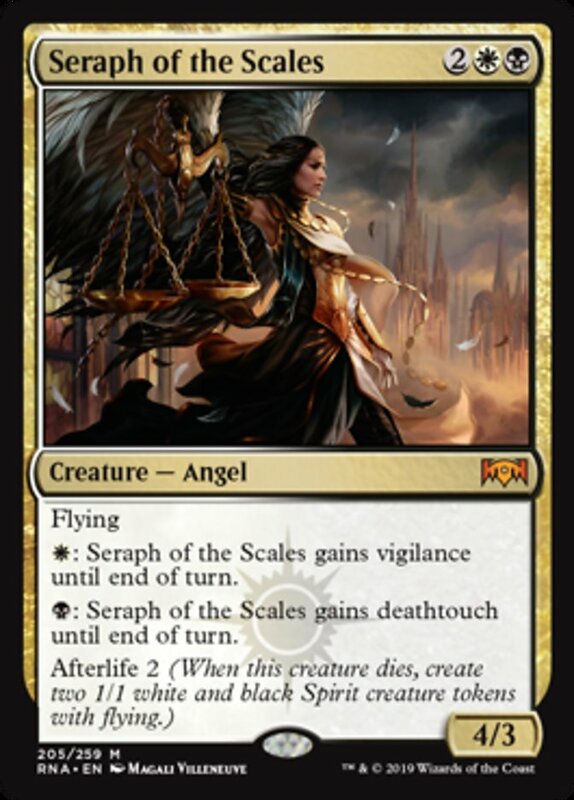 Seraph of the Scales was definitely designed with Limited and/or Constructed in mind. A 4/3 flier with optional other abilities that splits into two 1/1 fliers when it dies is darn good value in a 1v1 20-life format. 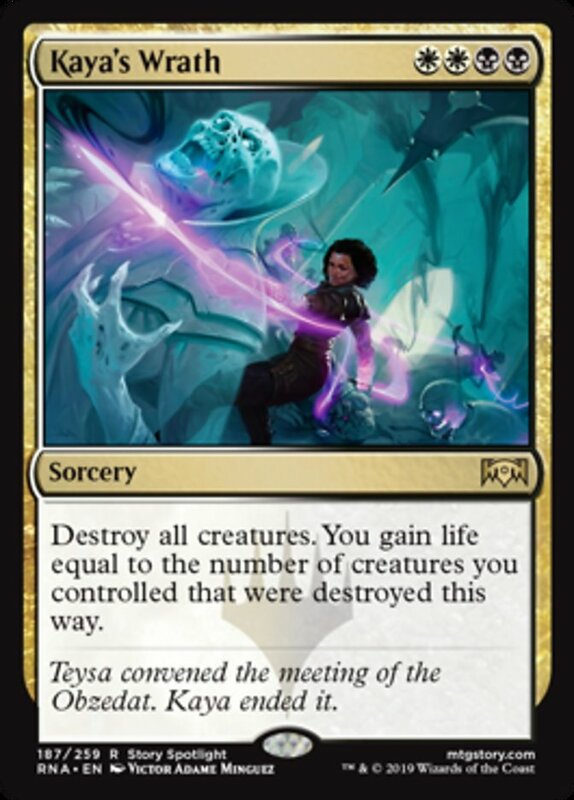 In EDH, however, where you have to bring down two or three other players with 40 life each, this card is generally not going to get you there. That said, as a Melvin, this card appeals to me, and I imagine it might appeal to other Mels as well. If I was going to try this out I might put it in something like a fair Karador Ghost Chieftain value-beats deck or Tariel, Reckoner of Souls Angel tribal, but I would do so with heavily tempered expectations. Those are my hot takes for the Orzhov Syndicate in this set. Do you agree? Disagree? Did I miss anything? Let me know what you think in the comments below, or on Twitter @Grubfellow where I tweet #dailyEDH microcontent. In the meantime, stay spooky, and whether you’re alive or undead, make sure you stay on Kaya’s good side!